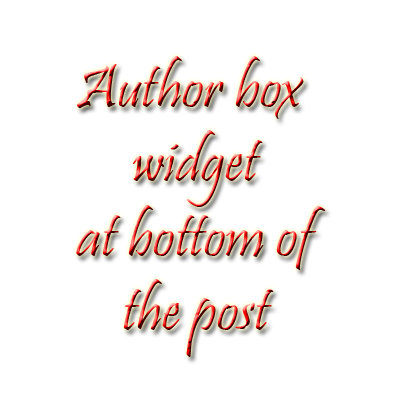 Author box is for giving information about who has written the post. It is mainly posted to bottom of each post. It is very useful gadget to add on your blog because when your blog is multi authored and your blog have some guest post, then this gadget will help you knowing your guest bloggers! If it’ll look better then readers attract from this. # First go to your blog dashboard and click on template tab. # Then click on Backup/Restore button and click on Download full template. # After download , Close it and click on Edit HTML . # Then search for (Ctrl + F) , <div class=’post-footer-line post-footer-line-1′> or <div class=’post-footer-line post-footer-line-2′> and Paste below code above it . Contact me for any queries!! !^^! Replace your links with the links which is highlighted with yellow. and also change the name . !^^! Then search for <b:skin> and expand it. [New template changes] then search for </b:skin> and paste below code above it. !^^! You can change colors and transform and also border-radius with your choice. !^^! Now save the template and enjoy. We are giving you more colorful modifications. # Search for (Ctrl + F) , <div class=’post-footer-line post-footer-line-1′> or <div class=’post-footer-line post-footer-line-2′> and Paste below code above it . # Replace your links with the links which is highlighted with yellow. and also change the name . # Then search for <b:skin> and expand it. [New template changes] then search for </b:skin> and paste below code above it. !^^! Don’t forget to bookmark our new url seebeetee.com. !^^! If you have any queries or problem just comment.